The Great Southern Stamp Sale: Oh, and the Vegie stamps are finishing too! Oh, and the Vegie stamps are finishing too! The fruit and Vegie stamps are finishing tomorrow too. What do you do with Vegie stamps? Well, here's one I made earlier. My friend is mad on her Thermomix, a super good blender kitchen gadgety thing. 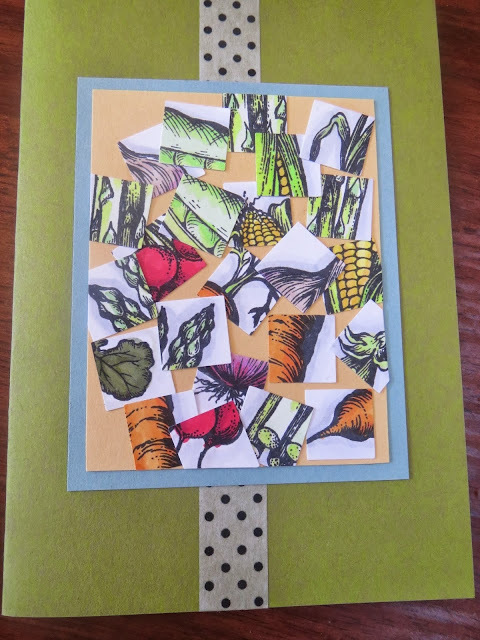 So, of course, for her birthday card, I used a lot of Vegie stamps. And put them in a blender! Have fun with your stamps, folks, it's why we have them. Have you seen the PSX Orange stamp? Last call for PSX Teddy Bear Stamps! Teddy bear stamps are for sale! I have some Stampscapes stamps for sale! The Great Sale - Garden themed stamps are done! The Great Southern Stamp Sale rises again!